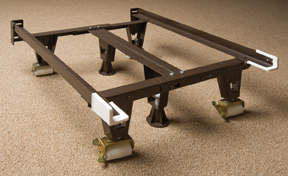 Metal Bed Frames | The Organic Mattress Store® Inc.
Ok, Your tired of that big old wooden bed and you want a good metal bed frame. These frames are made in The USA, and we have been selling them for over 14 years now. There sturdy and strong and don’t squeak. Plastic end caps make sure your mattress does not get ripped. Center supports keep it solid and does not allow a dip. Rollers allow you to push it around. And there is a spot in the back to attach a headboard.